Another round of abuse on January 11, 2012 when City of Chicago Department of Water Management employee Patrick McDonough returned from testifying under oath at the Department of Human Resources Hearing for Bruce Randazzo. After having his car under video surveillance for the entire morning and early afternoon, Patrick McDonough returned to the North District yard to finish the work day and swipe out. 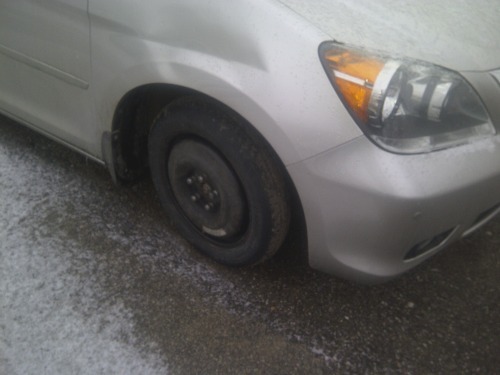 According to Mr. McDonough, his boss told him his tire was almost flat. These brand new tires were just purchased a month ago. Joey “The Slicer” Berlin was also subject to testimony and now parks his car near the security guard shack to monitor the safety of his car. Glenn “The Shooter” Schultz was not available to comment. Bruce “The Candidate” Randazzo was very upset this would happen to a witness and a fellow City Worker. The next day in court, Attorney Ivan Tomic told Maureen Egan about the tire slashing on McDonough’s automobile. Maureen Egan also told Ivan Tomic to have Mr. McDonough send pictures to her. The various security folks at the DOWM have been notified, but Mr. McDonough is still waiting for officials to take pictures and investigate. So far two fenders have been bashed in, stones thrown at the car, and multiple tire slashes are a common occurrence at the Water Department lot located at 4900 West Sunnyside. Most of the damage has been separate events with a damage amount of about $500.00 to $700.00. The City of Chicago should protect employees that tell the truth and step forward to combat corruption. Mr. McDonough also reported today that Maureen Egan refuses to pay McDonough for his court ordered appearances despite a subpoena signed by Revered Lucius Hall. I think Joey “The Slicer” Berlin will also demand more security for all City Employees. I will keep you updated on this story. The destruction of someone’s car is the kind of 36Th Ward style politics that made folks sick of the Bank’s Gangsters. Next PostNext Tommie Talley back getting taxpayer&apos;s loot for nothing?